Before you read on if you haven’t been in-briefed on Have Doughnut go read. MiG-21f-13 “Fishbed-C”. Image credit Wikipedia. 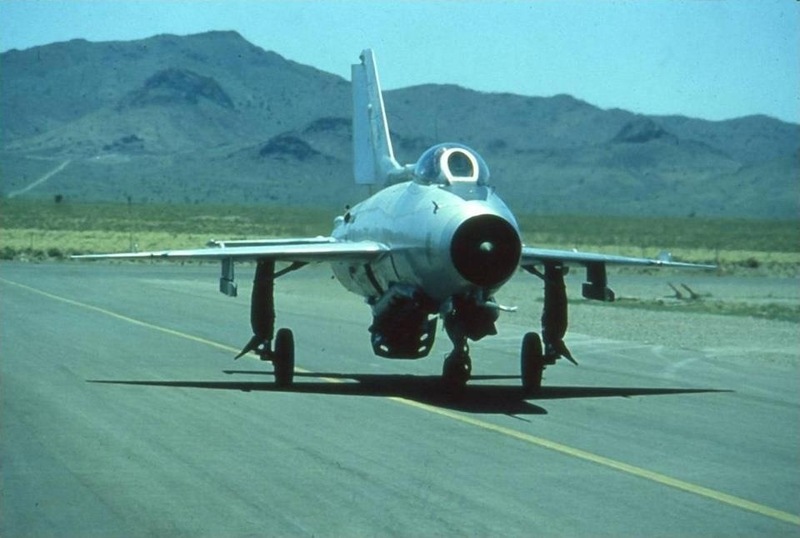 Have Doughnut was the combat evaluation of the Soviet-built MIG-21F-13 (NATO codenamed) “Fishbed-C.” The F-13 version of the -21 is an early version of the ubiquitous MiG-21 family. It was the first short range day fighter version of the -21 to be placed in mass production and was the first variant to use the K-13 air-to-air-missile. The -21F13 was also in service with the North Vietnamese Air Force and saw regular combat against USAF and USN combat aircraft in-theater. Constant Peg was a training program that took Have Doughnut a step further an under the auspicies of the 4477th Test and Evaluation Force. The “Red Eagles” as they became known, equipped with the MiG-21F-13, provided a somewhat formalized training environment, for both USAF and USN fighter pilots that saw the MiG as the primary threat aircraft. 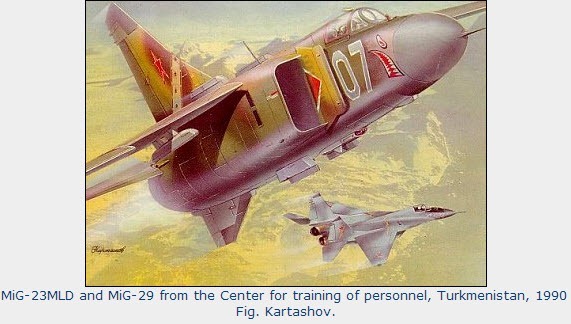 By the late 1970s, United States MiG operations were undergoing another change. 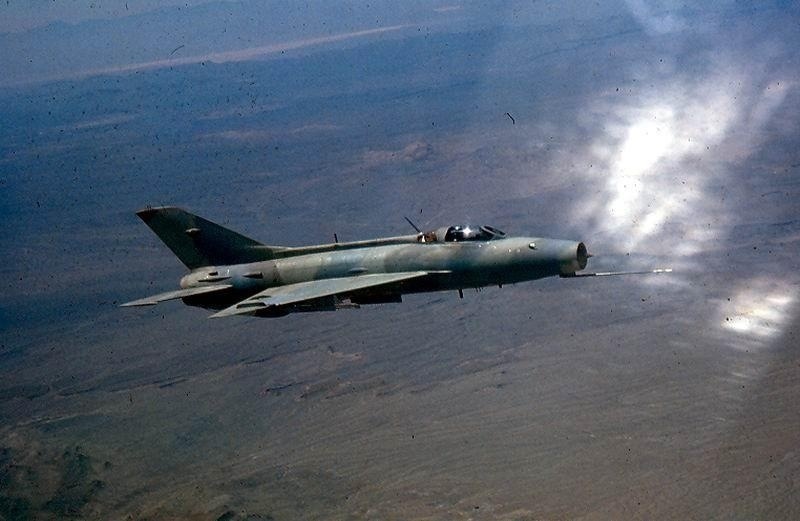 In the late 1960s, the MiG-17 and MiG-21F were still frontline aircraft. A decade later, they had been superseded by later-model MiG-21s and new aircraft, such as the MiG-23. Fortunately, a new source of supply of Soviet aircraft became available, Egypt. In the mid-1970s, relations between Egypt and the Soviet Union had become strained, and Soviet advisers were ordered out. The Soviets had provided the Egyptian air force with MiGs since the mid-1950s. Now, with their traditional source out of the picture, the Egyptians began looking west. They turned to United States companies for parts to support their late-model MiG-21s and MiG-23s. Very soon, a deal was made. 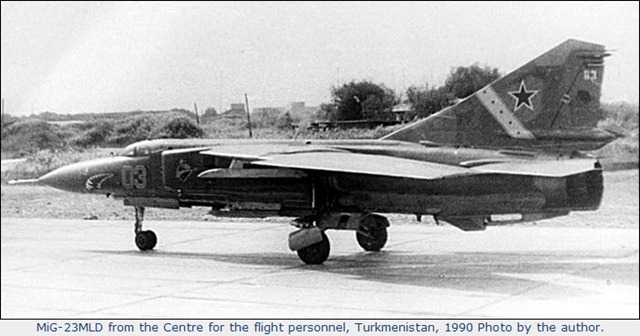 According to one account, two MiG-23 fighter bombers were given to the United States by Egyptian president Anwar Sadat. The planes were disassembled and shipped from Egypt to Edwards Air Force Base. They were then transferred initially to Groom Lake for reassembly and study. 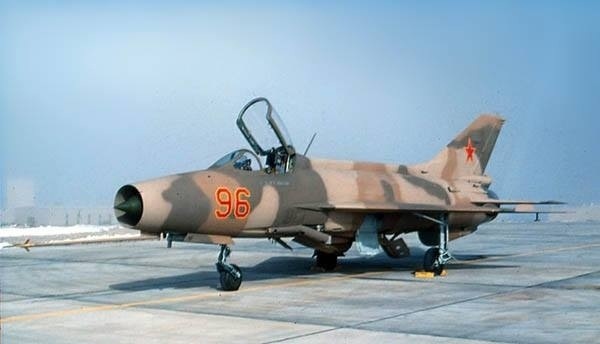 In 1987, the U.S. Air Force bought 12 new Shenyang F-7Bs from China for use in the Constant Peg program. At the same time, it retired the remaining MiG-21F-13 Fishbeds acquired from Indonesia. The United States operated MiGs received special designations. There was the practical problem of what to call the aircraft. This was solved by giving them numbers in the Century Series. The MiG-21s and Shenyang F-7Bs were called the “YF-110” (the original designation for the USAF F-4C), while the MiG-23s were called the “YF-113”. The focus of Air Force Systems Command (AFSC) limited the use of the fighter as a tool with which to train the front line tactical fighter pilots. Air Force Systems Command recruited its pilots from the Air Force Flight Test Center at Edwards Air Force Base, California, who were usually graduates from either the Air Force Test Pilot School at Edwards or the Naval Test Pilot School at NAS Patuxent River, Maryland. 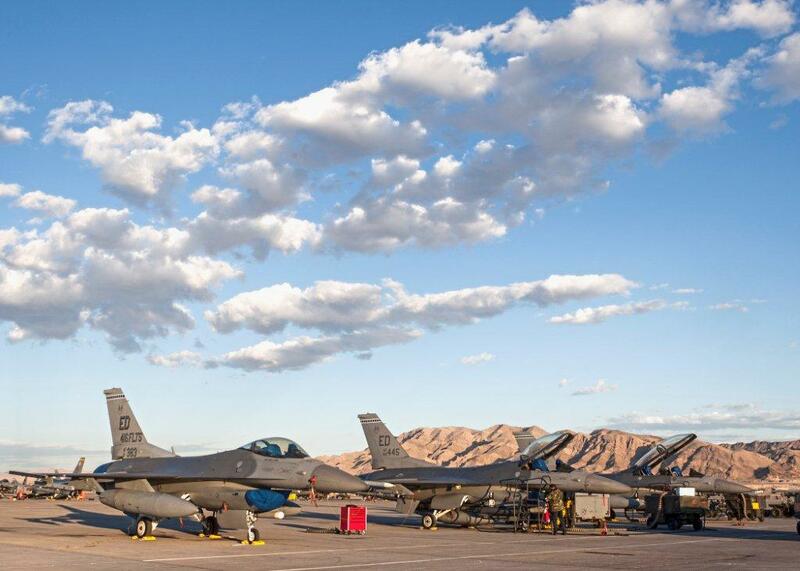 Tactical Air Command selected its pilots primarily from the ranks of the Weapons School graduates at Nellis AFB. The 4477th began as the 4477th Test and Evaluation Flight (4477 TEF), which began 17 July 1979. The name was later changed to the 4477th Test and Evaluation Squadron (4477 TES) in 1980. The 4477th began with three MiGs: two MiG-17Fs and a MiG-21 loaned by Israel, who had captured them from the Syrian Air Force and Iraqi Air Force. Later, it added MiG-21s from the Indonesian Air Force. 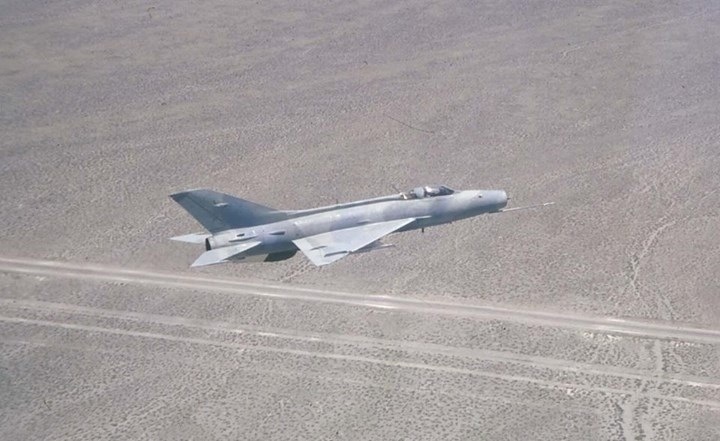 Here are some newer photos of those MiG-21F-13s at the Tonopah Test Range sporting Soviet Air Force markings and cavorting about the Tonopah Test Range, probably in the 1970s. Several of these photos are probably in Steve Davies “Red Eagles” and Gail Peck’s “America’s Secret MiG Squadrons.” According to both of these books, after the aircraft reached the end of their useful lives, they mysteriously appeared at several museums throughout the United States. Reportedly, as the aircraft were dropped off, curators were told not to ask any questions about the aircraft. If you haven’t read either “Red Eagles” or “America’s Secret MiG Squadrons” you should. You’ll get more information than what you read on the Wikipedia page. Most readers will already be familiar with the famed US Navy “graduate level” ACM program, TOPGUN (yeah, that’s one word, all caps) and the USAF’s Fighter Weapons School and the Red Flag exercises. During the Cold War did the Soviet Air Force have a similar program. That’s indeed the case and that the topic of this post. Due to very poor showing of Soviet built aircraft in the 1967 Arab-Israeli War, the Soviet Union began a program generally known with the Soviet Air Force as The Center for Flight Personnel. The Center was located in Turkmenistan at an airbase called Maryy-1 (Maryy is pronounced “Marie). Located at this base is a unit known as the 1521st Airbase unit. 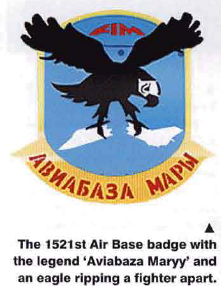 The 1521st consisted of 3 squadrons, 2 that would be considered “aggressor” units both flying the MiG-29 and an additional unit that operated the La-17 drone for target practice for the visiting Soviet Air Force units. The squadrons of the 1521st was formed in 1974 and flew the MiG-21bis. Pilots for these squadrons contained a higher number of highly experienced pilots (distinctions of combat pilot experience in Soviet forces at the time were known as “First Class” and “Sniper” level pilots). These units had a higher proportion of these highly experienced pilot when compared to regular Soviet Air Force units. -assessment of individual pilot skills. -low level flying over the area’s featureless terrain for aircrew familiarization. -ACM and QRA performance assessment. -tactical excerises involving multiple aircraft. -live missile launch and gunnery. 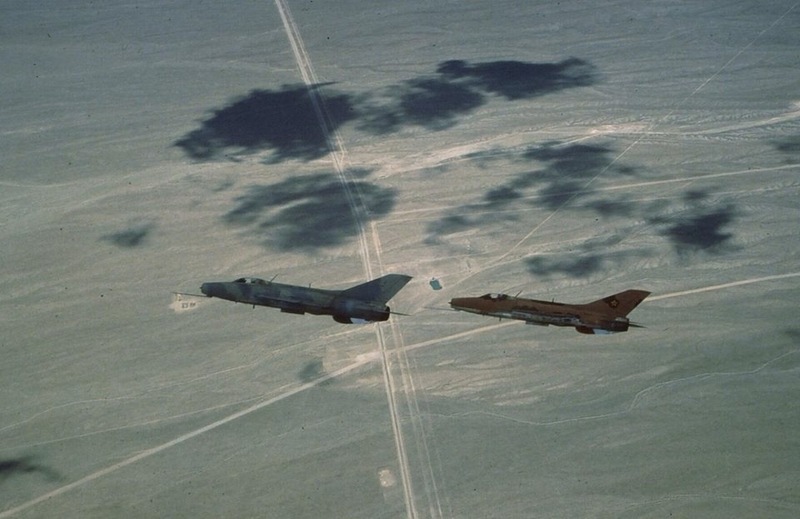 It should be noted that the Soviet Air Force had no TACTS system with which to provide real-time monitoring of aircraft involved in ACM (such as that used by the USAF and US Navy). All training was monitored in real time over the radio using a GCI from the 1521st and another controller from the visiting unit. Soviet Air Force regiments’ results reflected on it’s graded readiness level and as expected getting a perfect score in the evaluation was very difficult. 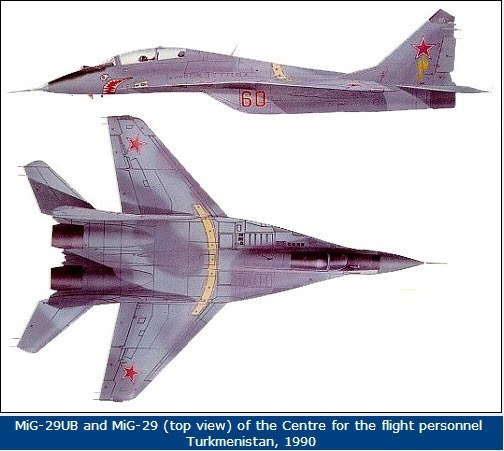 The 1st Squadron of the 1521st initially flew the MiG-21bis and then the MiG-29 Fulcrum-C. 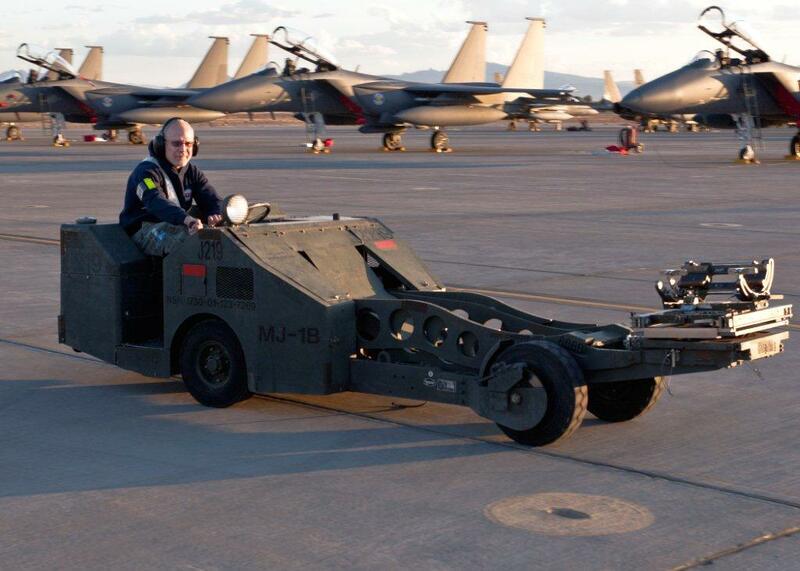 The tips of the horizontal stabilator and the wingtips were painted yellow, with a black outline, to make the aircraft look like the F-15 Eagle. To keep up that appearance, angled black converging in a black and yellow chevron were applied aft of the cockpit. Sharkmouth markings were also added to aircraft based on ground crew preference. The 1st Squadron markings consisted of saber-toothed Tiger with a winged number “1.” The current status of this squadron is not known. The 2nd Squadron of the 1521st first flew the MiG-23MLD. There were plans to reequip the squadron with the Su-27 Flanker but instead received high-time MiG-29 airframes. 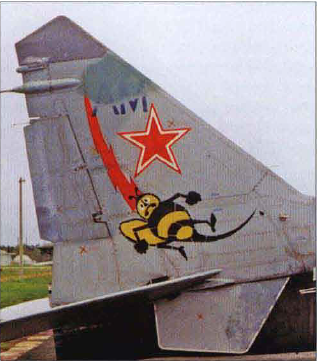 These aircraft also featured sharkmouth markings with other marking consisting of a “sour-faced” hornet superimposed on a red lightning bolt with the letters “AM” (aviabaza Maryy, airbase Marie) above it. 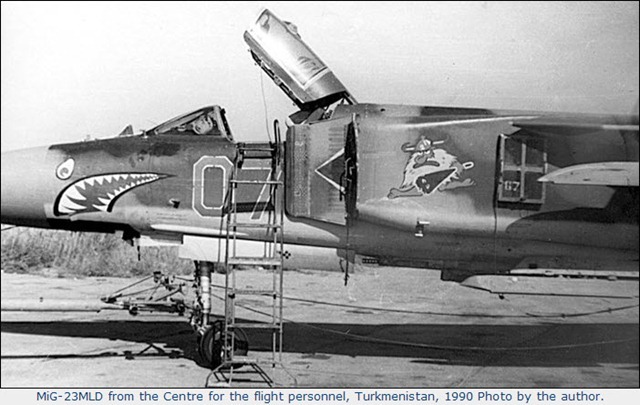 After the collapse of the Soviet Union, the 2nd Squadron’s aircraft were transferred to the Kazakstan Air Force. There really isn’t a lot of open-source information, either from books or the DTIC publication database. 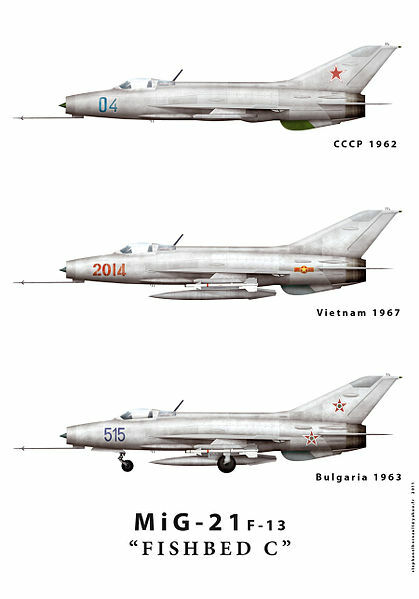 According to these sources there isn’t even references to these squadrons in Soviet defense publications.